Clear oceanic waters of Palmyra Atoll, central Pacific. High structural complexity built by the reef framework like this is becoming increasingly rare for coral reef ecosystems.Leading coral reef science experts call for new ’safe operating spaces’ to be agreed to ensure the survival of valuable coral reefs for the future. The threats to the continued existence of coral reefs are mainly directly or indirectly man–made through activities such as fishing, pollution or global warming. The authors hope that providing safe operating parameters will provide a more positive and manageable aim which can be agreed, than drawing thresholds beyond which the future sustainability of functioning of coral reefs would be at risk. 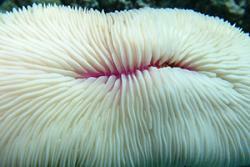 A bleached mushroom coral. The white appearance is caused by the loss of the coral’s symbiotic zooxanthellae in response to thermal stress. 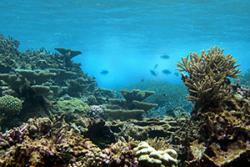 Without the zooxanthellae, the coral will eventually suffer mortality. “Coral reefs are valuable for biodiversity, food security, coastal protection and numerous other things and we need to ensure their continued persistence in this era of rapid change. Rather than push these ecosystems beyond their limits, beyond so called tipping points, we are calling for ‘safe operating spaces’ to be identified that will ensure we can still use coral reefs for ecosystems services without exhausting their capabilities for future survival. The guidelines which will seek to manage local and global human impacts such as fishing, nutrient pollution and ocean warming and acidification, all of which have detrimental effects on the health of coral reefs. The guidelines include measures such as the safe limits for carbon dioxide concentrations in the ocean (as the oceans absorb increased atmospheric CO2), which causes / contributes to the destruction of coral reefs. These should remain within or below 340- 480 part per million (even though they are currently at 400 ppm and we have experienced the worst and most widespread coral bleaching in history). The coral reefs are an important food source- but they also act as natural ‘reserves’ for fish. The paper suggests that if there is fishing, 500-250 kg of fish per hectare should remain, to avoid overfishing these areas. Current local marine protected areas can offer local socioeconomic and ecological benefits, but these should be all-inclusive and holistic, and water quality should stay between 0.45-0.55 micro grams per litre chlorophyll per litre. Chlorophyll blooms when the water has an increased level of nutrients from pollution or run off from human activities such as farming or pollution, and also affects the coral. 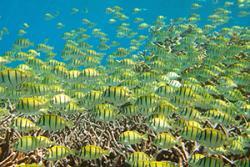 Healthy reefs often have a large biomass of herbivorous fishes such as these Convict Tangs. Herbivores are often targeted by fishers on coral reefs. “While some of these activities can and are being managed at a local level, the perhaps bigger threat of global climate change and its impacts to coral reefs requires global cooperation amongst governments to urgently cut greenhouse gas emissions” explains Williams. While the world is moving in the right direction with the Paris climate agreement, which comes into force this Friday, November 4, and Goal 14 of the United Nations Sustainable Development Goals which encompasses ten targets for the oceans and a clause of the Convention of Biological Diversity ‘s Aichi targets which explicitly calls for the minimizing of human pressure on coral reefs and maintenance of their integrity and functioning, the authors hope that guidelines will help in bringing further attention and positive steps which can be refined as more research is conducted, in order to ensure the future sustainability of coral.